If you have notice the sidebar on the right… yeah.. i’ve just sign up EntreCard to try out. It is consider your online blog “business card” in the form of a 125×125 image which represents you and your blog. The concept is to “drop” your EntreCard at other blogs who also has EntreCard widget in their blog. You will earn credit when you drop your EntreCard at other blogs and when other bloggers drop you their EntreCard. You can then use the credits to purchase 125×125 ads in the EntreCard network. Check the site for how it works. 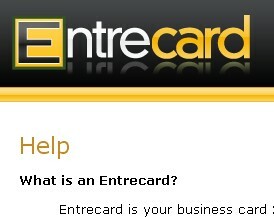 EntreCard is like an ad exchange network but with innovative concept. You get real valuable bloggers visiting to your blog, leave you an EntreCard. Then usually you will check back at their blog and drop them yours. The thing which i dont like about is the ad only last for 1 day… no way to choose longer duration. And there is no good transaction history / log of how much credit i spent at which ad or how much i earn for ads that i run. I’m sure they will improve the system as time goes. 26 people had something to say. What do you think? Most should have heard about the Million Dollar Home Page, i just went to look at it briefly, it is totally sold out and i have a headache after looking at the bunch of million pixels. After the success of Million Dollar Home Page, there are many copycats replicating it using a commercial pixel script. However, these copycat sites lacked the initial novelty and most have failed. Few months ago, a student, Graham Langdon, at the University of Connecticut implement the idea of MillionDollarHomePage into a wiki script, Million Dollar Wiki, making the first pay-per-page model of a wiki. His purpose is to raise money to pay off his college fee and to give him the resources to open the a bar in Boston. After reading the post of Million Dollar Wiki at Shoemoney, i have the feeling that a lot of these paid wiki sites are going to pop out in the webmaster community. Indeed, i just chanced upon a site, One Buck Wiki, through the commenter here. One Buck Wiki is similar to Million Dollar Wiki except it is cheaper 😀 and seems more successful with its marketing. I just bought a page to try it out. Although it started as one buck a page, the price of the page gradually increase as the number of pages sold increase. I feel that it is more worth it to purchase a page in such sites than at those pixel sites. Dont think anyone is really going to click at those mini pixels. Anyone can easily setup such paid wiki sites, however, it is how well such sites can market themselves and help the whole paid wiki pages there to increase their exposure that matters and differentiate themselves from other similar sites. If you have tried such sites, feel free to let us know your result. 20 people had something to say. What do you think? The current prize pool is $9. So i will draw 1 winner for the October 2007 Contest. The prize money will be sent via paypal. Check out the monthly contest rules and the contest entries. This is an ongoing monthly contest. As long as SiteFever’s link continue to remain in your site, you will always be in the draw. The more people participate to link to SiteFever, the bigger the prize pool, the more winners we will have. 42 people had something to say. What do you think?